With influences ranging from Andres Segovia to Mississippi John Hurt, Ed Gerhard is one of the true masters of steel string finger style guitar. A Philadelphia native now residing in New Hampshire, Ed performs with passionate intensity and a sly sense of humor on 6-string, 12-string, and slide guitars—including the esoteric and beautifully toned Weissenborn (Hawaiian lap steel guitar). Melodic and cliché-free, his lush playing travels in unexpected directions, conveying classic sensibilities or inflections of the blues. The Boston Globe summed it up beautifully by declaring that "Ed does not write instrumentals. He writes songs that only a guitar can sing." Ed has received numerous honors since his critically acclaimed debut album in 1987, Night Birds including a 2005 Grammy Award for Best Pop Instrumental Album for Henry Mancini: Pink Guitar. In 2010, Ed's CD Luna was included in Acoustic Guitar Magazine's 20th Anniversary List of 240 Essential Albums. 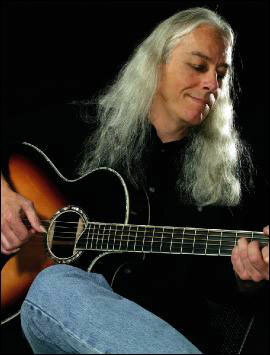 His guitar work can be heard on CDs by Arlo Guthrie and Jorma Kaukonen and is featured in the Ken Burns' films Mark Twain and The National Parks: America's Best Idea. He returns to the Freight tonight to dip into a deep repertoire from a long and luminous career and dazzle with tunes from his soon to be released CD.